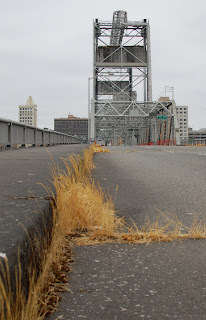 I explored two closed bridges today in Tacoma. This is the Murray Morgan Bridge, which spans the waterway running between the downtown area and the Port of Tacoma. It's a lift bridge that was built in 1912, but it's been closed since 2007. The bridge is judged to be unsafe, and requires $80M in repairs before it can resume bearing vehicular traffic. Current plans are for WSDOT to permanently lock the bridge in the raised position to allow marine traffic to pass.